Recessions have a way of reorienting or even restructuring an economy. Some industries fall back, others step forward. These changes propel entire regional economies ahead of others depending upon the nature of the business cycle. As we document in our new research report, Portland has been Top 5 for high-wage job growth, rising levels of educational attainment, and household income gains. 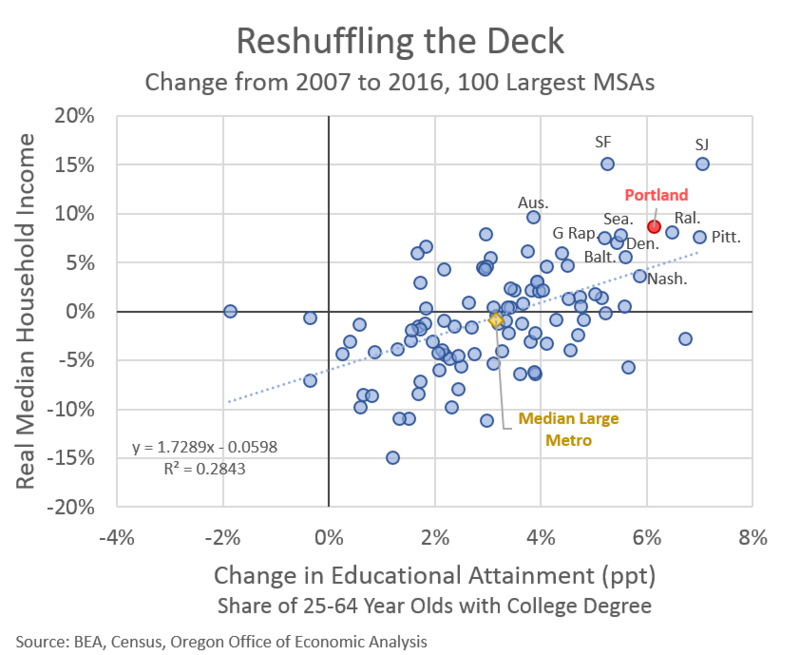 However, Portland is not alone when it comes to seeing big gains, as shown below in this edition of the Graph of the Week. Many of the other metros seeing similar growth to Portland are no surprise. These include Austin, the Bay Area, Denver, and Seattle, among others. However, there are a few surprises. In terms of relative rankings, the only other metros besides Portland to see such sizable jumps were Grand Rapids, MI and Pittsburgh, PA. While similar in percentage changes to Portland, these other two metros were starting from a different base. I would also argue that the changes in Grand Rapids and Pittsburgh have been even more transformational than in Portland. Portland went from the top third to the top fifth of metros for these measures. Grand Rapids went from 61st to 43rd for income, and 73rd to 51st for educational attainment. Pittsburgh, already a highly-educated metro, went from 38th to 22nd for educational attainment, but from 81st to 58th for household income. Those are massive gains, but different in nature than those seen here in Oregon.